If you are building a site that will be in Arabic or another language that requires the text to be formatted so it reads from right to left, you will need to switch on RTL within your project so the text formats correctly. To enable RTL within a Blocs project, first you’ll need to access the project settings, you can do this by navigating to File > Project settings from the apps main menu. 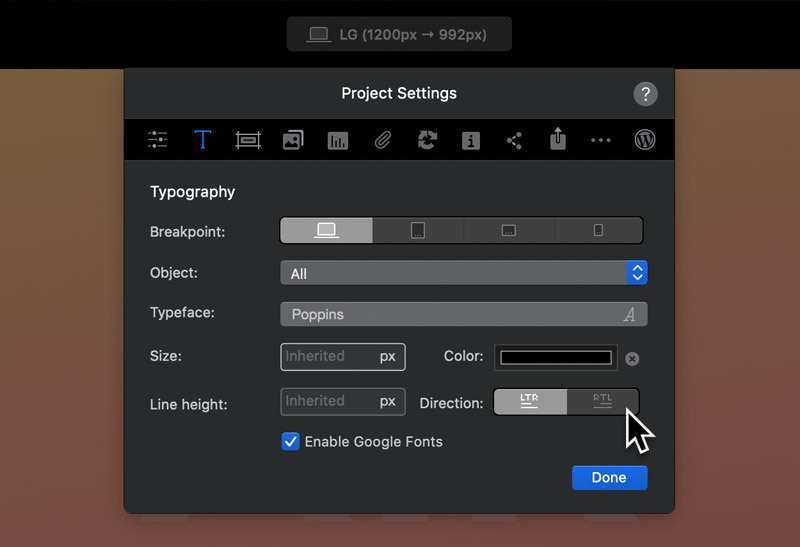 Now that the project settings sheet is open, Left Click on the T symbol and you will be presented with the projects’ global text options. Towards the bottom of the options you will see a segmented control labelled Direction. This control allows you to easily set the way the text reads on your site, using either left to right LTR or right to left RTL.